2012 might just be the year when I get my craft room organized. I know I said that last year. In fact, almost a year ago to the day I wrote a post featuring craft room inspiration, too! I was determined to create my own little crafting space, but life gets busy. I end up crafting on the floor in between piles of stuff! My room holds my stuff, but it's hardly cute, and it's hardly organized. I've made some progress, though. I have furniture. I have a rocking desk from The Original Scrapbox. And a sewing table. But it's all a hodgepodge of furniture of varying colors and styles. I'm dying to paint or stencil, but we're still waiting to buy a home first. I know, I know. It's all a bunch of excuses! I hope to finally get everything organized the way I would like someday soon! 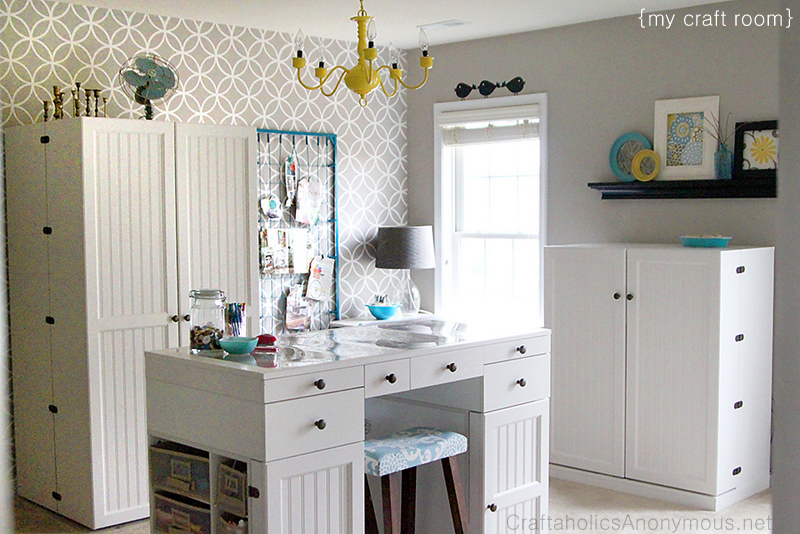 I have serious craft envy about this craft room from Craftaholics Anonymous. I have that very same desk, (care of The Original Scrapbox). 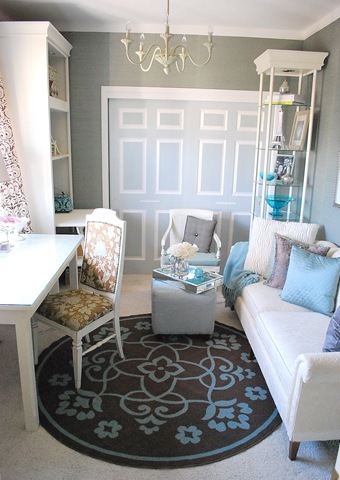 But I also adore that chandelier, the stenciled wall, and the entire color scheme! I am all for finding creative ways to organize and repurpose old furniture. 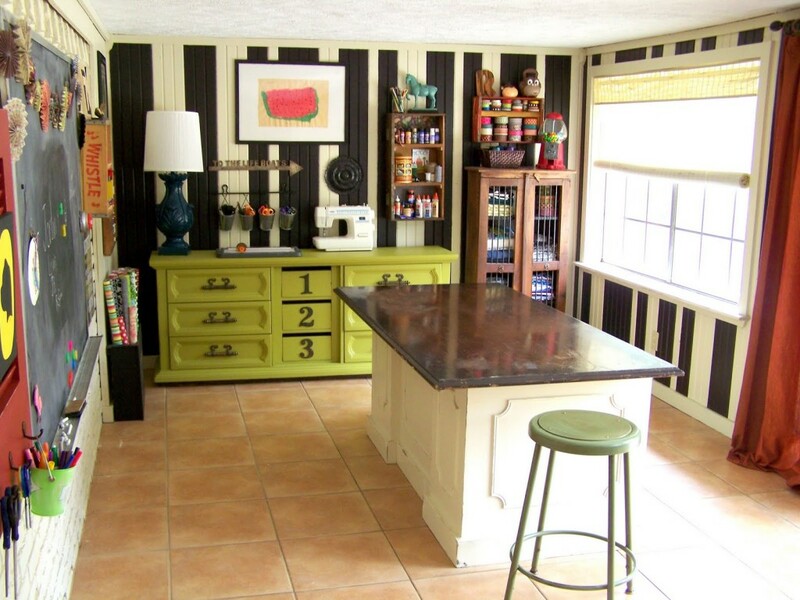 This crafting space was created from an old TV hutch! Pretty cool! I spotted this idea at Dwelement. When it comes to decor, I am not usually a "modern" person. But I find myself loving clean lines in craft rooms. 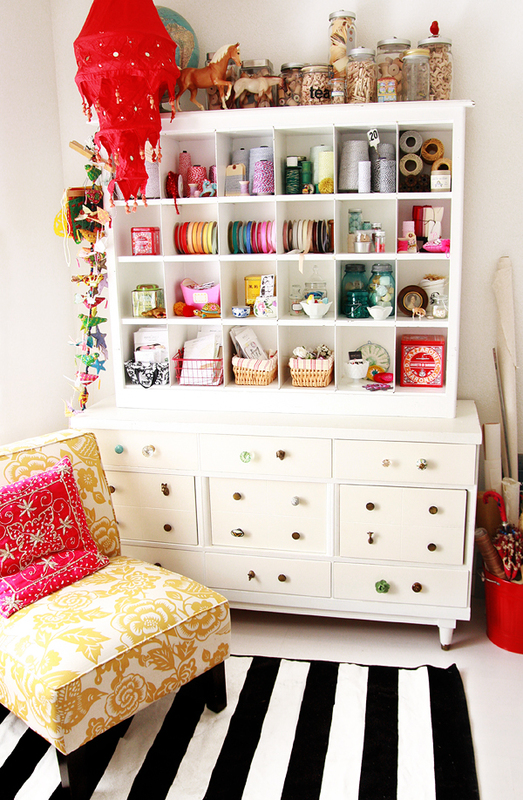 I love the white in this modern craft room. And the drawers--oh, the drawers! Love all that storage. You can see the before and after of this space at Design Sponge. I love looking at the craft rooms in magazines, but I really love seeing how people create their own creative spaces on a budget. 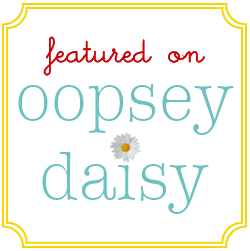 Older and Wiser created her space on the cheap. And I love how it turned out! 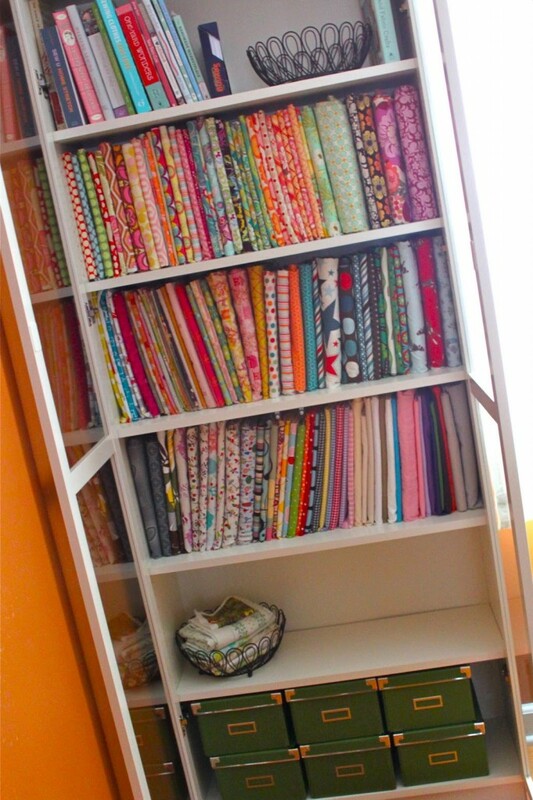 I'm thinking that Smashed Peas and Carrots has the right idea with her fabric storage in her studio. This just makes me happy! 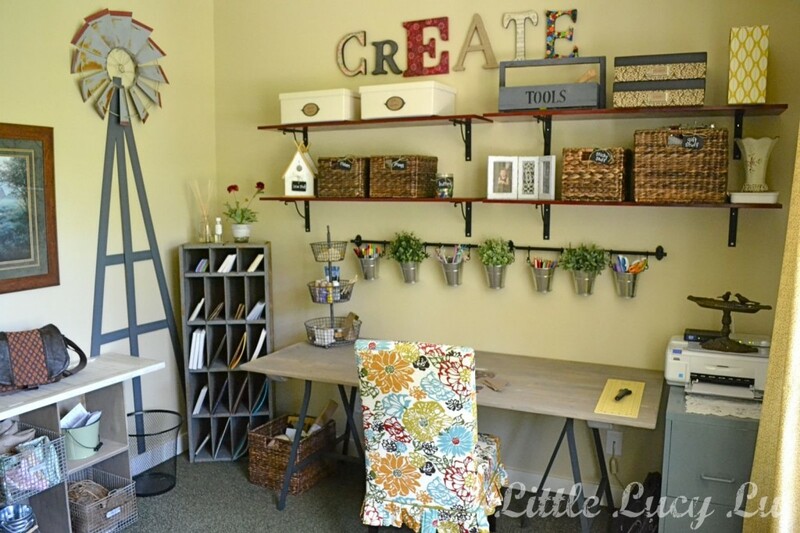 I love all of the organization options in this craft room from Little Lucy Lu. Don't you love that windmill too?! So sweet! This color scheme is a little different, and I love it! I fell in love with this studio (and that rug!) at Art as Life. A sofa in my own little space?! Yes please! Love this entire office from Centsational Girl. 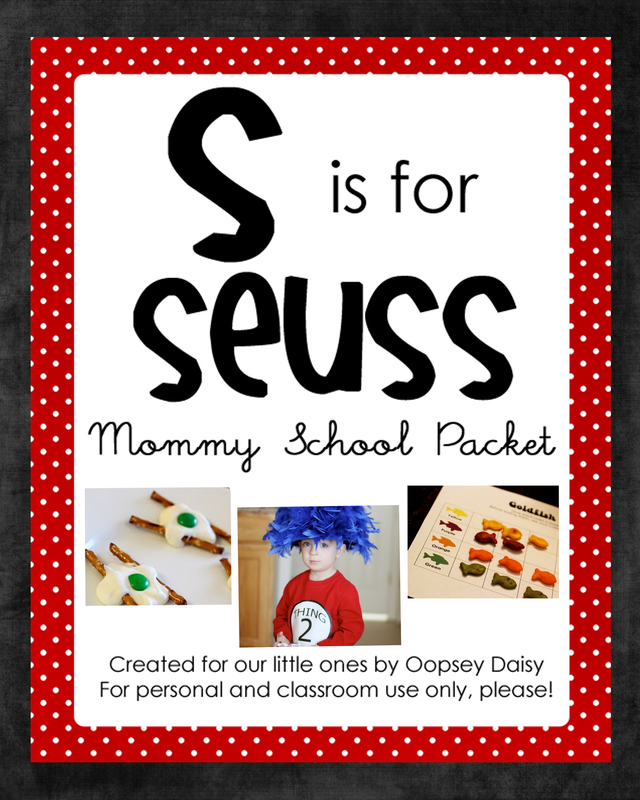 Though I may be tempted to curl up and take a nap during "craft time!" 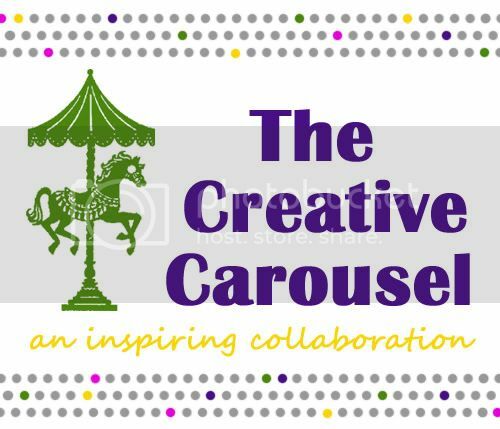 So what is your favorite craft space? Where do you craft, and is it organized? P.S. 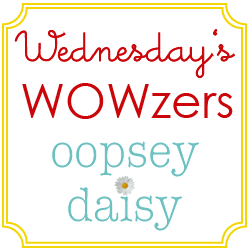 Don't forget to come back tomorrow for Wednesday's Wowzers! I can't wait to see what you've been making!